The Doodle Oak was thought to date from around 10-11th century and its predecessor may have been upwards of a thousand years old before this one took its place. 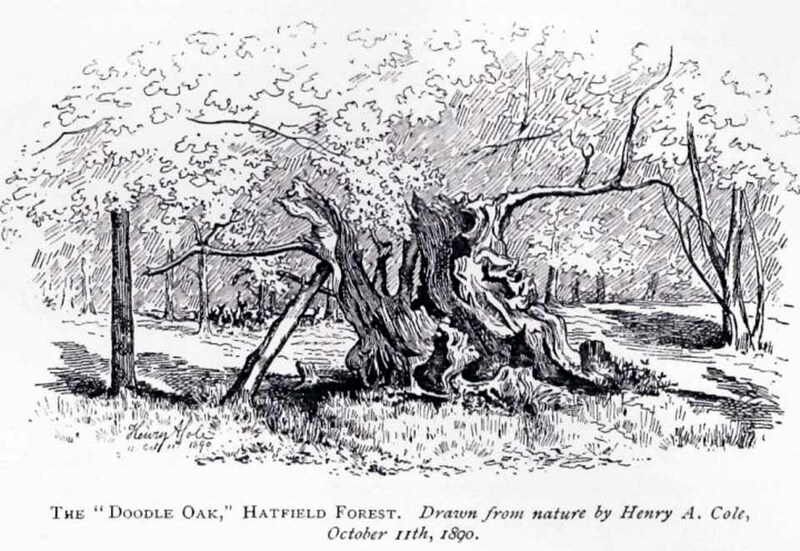 In 1949, one patient botanist, Maynard Greville, investigated the Doodle Oak tree-rings and found it to be 850 years old. Other estimates suggest it was a hundred years older than that! 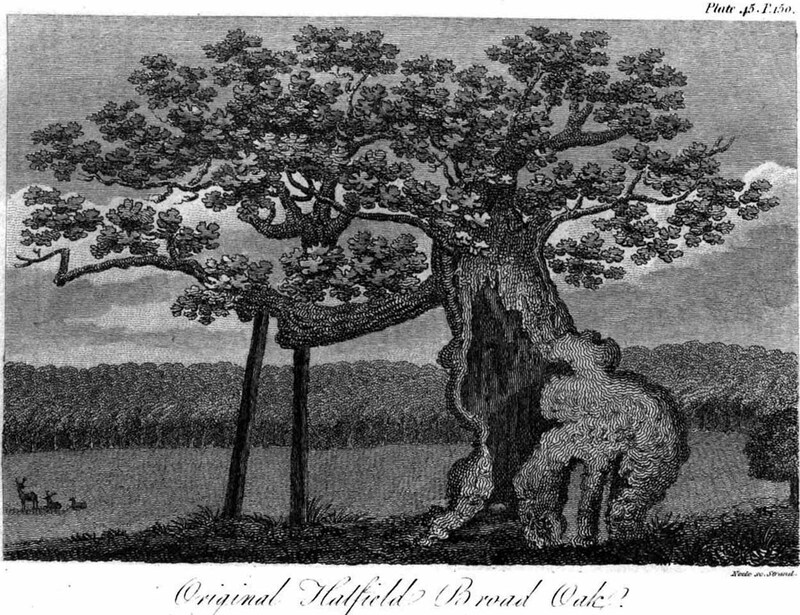 Whichever was the correct one, a measurement of its trunk found it to be some 19 yards in circumference – one of the largest trees ever recorded in Britain! Sketches of its dying body were thankfully made near the beginning and the end of the 19th century: one in Mr Vancouver’s (1807) Agriculture of Essex, and the other by Henry Cole of the Essex Naturalist journal. Gepp, Edward, Contributions to an Essex Dialect Dictionary, George Routledge: London 1920. Morant, Philip, The History and Antiquities of the County of Essex – volume 2, 1763. Reaney, P.H., The Place-Names of Essex, Cambridge University Press 1935. Vancouver, Charles, General View of the Agriculture of the County of Essex – volume 2, Richard Phillips: Blackfriars 1807. Winsland, Charles, The Church of Saint Mary the Virgin, Hatfield Broad Oak, Anchor: Bishop Stortford 1952. Wright, Thomas, English Dialect Dictionary – volume 2, Henry Frowde: London 1900. 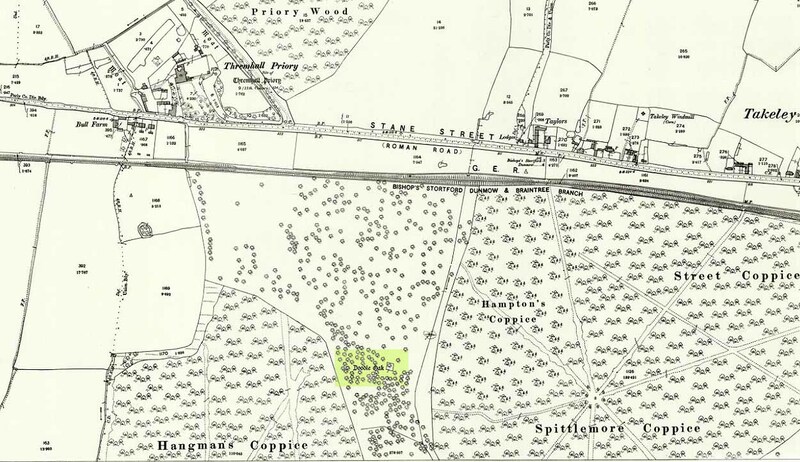 This entry was posted in England (south), Essex, Sacred Nature and tagged animism, antiquarian, antiquities, Archaeology, Bishops Stortford, boundaries, dialect, druids, Essex, Hatfield Broad Oak, heritage, medieval history, moots, oaks, Stanstead airport, Takeley, Trees. Bookmark the permalink.